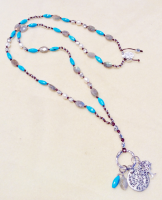 What To Do > Colorado > Vail Valley > Activities > Portofino Jewelry - Jewelry Making for All Ages! Portofino Jewelry offers a unique experience for your family to enjoy a creative vacation activity together. Making jewelry is easier than you think. All ages and skill levels are welcome. Trained staff want to help you and provide all the supplies you need and make it especially easy for kids. Kids can choose from lots of beads & charms that are cost-appropriate. A handmade keepsake helps them create memories of your Beaver Creek vacation! Call to make arrangements to come in. Special, events, like a birthday or bridal party, can be scheduled as well. Portofino Jewelry is located in Chapel Square in Avon, near Beaver Creek Resort and Vail. Activity - Jewelry Making for All Ages!